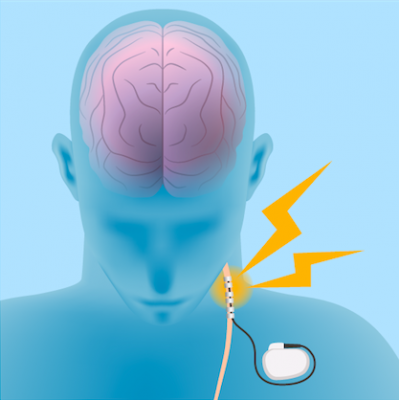 Vagus nerve stimulation (VNS) has been approved by the US Food and Drug Administration as an adjunctive therapy for treatment-resistant unipolar and bipolar depression since 2005. The treatment consists of a pacemaker-like device implanted under the skin in the chest that delivers regular, mild electrical pulses to the brain via the left vagus nerve. A 2017 study by Scott T. Aaronson and colleagues in the American Journal of Psychiatry reports that over a 5-year period, people with treatment-resistant depression who received VNS did better than those who received treatment as usual. The 795 participants at 61 US sites had either a depressive episode that had lasted for at least two years or had had three or more depressive episodes and had failed to respond to at least four treatments, including electroconvulsive therapy (ECT). Over five years, those who received VNS had higher response rates (67.6% versus 40.9%) and higher remission rates (43.3% versus 25.7%) compared to those who received treatment as usual. While the study by Aaronson and colleagues was non-blind and non-randomized, it suggests that VNS could be helpful in the long-term management of treatment-resistant unipolar and bipolar depression. Editor’s Note: VNS was FDA-approved for treatment-resistant seizures in patients aged 12 and older in 1997 and for children 4 years and older in 2017. It was also approved for cluster headaches in 2017. Insurance coverage and reimbursement for VNS is typically available for these neurological conditions, but not for the treatment of depression. This is an unfortunate example of the stigmatization of psychiatric illness—when an FDA-approved device can be kept from people in need of treatment. 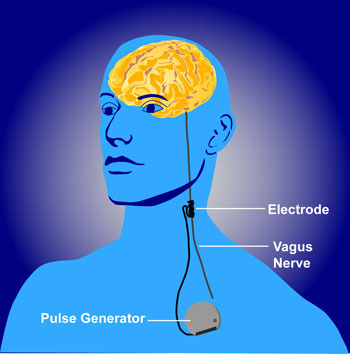 Vagal nerve stimulation is typically delivered via a stimulator in the chest wall. Vagal nerve stimulation (VNS) is an FDA-approved treatment for seizures and treatment-resistant depression. It typically requires an operation to insert a stimulator in a patient’s chest wall that delivers electrical impulses to their left vagus nerve via electrodes placed on the patient’s neck. New research by Bashar W. Badran and colleagues may have identified a less invasive and less expensive way to stimulate the vagal nerve—via electrodes placed on the ear. 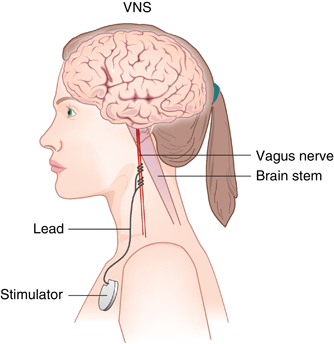 The researchers tested different parameters for vagal nerve stimulation via the ear on 15 healthy volunteers and found that this type of VNS was feasible, tolerable, and reasonably safe. Among the different parameters tested, a stimulation pulse width of 500 microseconds at 25Hz had the greatest effect on heart rate, slowing it by about 4.25 beats per minute compared to a sham treatment. Next Badran and colleagues plan to study the effects of this type of VNS on brain activity using functional magnetic resonance imaging (fMRI).